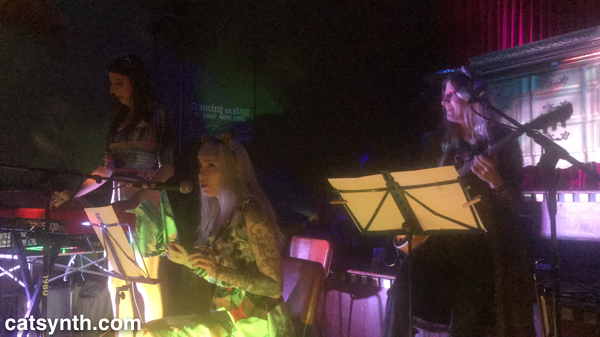 The final night of the Outsound New Music Summit featured a performance by Karen Borca, returning to the Bay Area for the first time in two decades. For those not familiar with Borca, she is one of the few bassoonists in avant-garde jazz and free jazz; and she had a long and illustrious career playing with many of the greats in the field, including Cecil Taylor and Jimmy Lyons. On this night, she was joined by two figures in the local jazz and experimental-music scene, Lisa Mezzacappa on bass and Donald Robinson on drums. Bassoon is a hard instrument to play in any genre, let alone jazz. But Borca made it sound effortless. There were sections that featured the instrument’s well-known lower registers, but also higher melodic lines and runs more often associated with saxophones. Interestingly, Borca discussed how she started on saxophone in school and was shredding the instrument until she was advised to try the bassoon, as it was both more challenging and more likely to make her stand out for scholarships and such. And this turned out to be the right decision. Musically, things unfolded with sparse lines and harmonies and the three performers bounced off one another. The best moments were when the notes from bassoon, bass and drum all seemed to form a single line. It was a shorter set, but very well received with audience clamoring for more afterwards. But I can understand that the music took a lot of energy. But it was a great experience, and Karen Borca has now taken her place alongside Wendy Carlos, Pauline Oliveros, and all the other women in music that I want to be when I finally grow up. The Karen Borca trio was preceded by Positive Knowledge, a project of Oluyemi Thomas (bass clarinet and other instruments) and Ijeoma Thomas (voice). They were joined by Hamir Atwal on drums. I have heard Positive Knowledge before, and know how their music unfolds. There are sparse, scratchy lines from Oluyemi’s bass clarinet and other wind instruments, including a shawm (or similar instrument), interspersed with Ijeoma’s vocals, which include passages of spoken word as well as more extended sounds. The music is at times quite percussive, but also melodic and energetic. There was an exuberance and joy in the sound, even in the moments that seemed to be melancholy. And Atwal’s drums added a foundational underpinning the sustained the set. So this concludes our coverage of the 2017 Outsound Music Summit. It was the longest we have covered, with five concerts plus Touch the Gear. It can be a bit of overload, so much music and fellowship in a week, but worth the effort. We look forward to next year, and the inspiration for all the musical adventures between now and then. Each night of the Outsound New Music Summit is different, but some more different than others. Such was the case with the fourth night of this year’s festival which featured two loud rock-oriented bands. The tone of the evening was set with the opening sounds from VOCO. 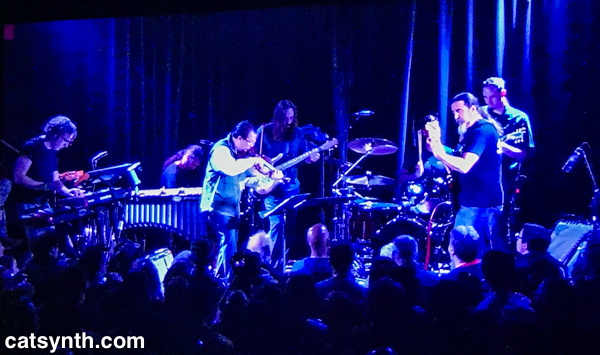 The group features Alex Yeung (of Say Bok Gwai) on guitar, Tim Sullivan on drums, and Josh Martin on bass, with guest Joshua Marshall on saxophone. Think rock power trio meets experimental jazz. The band is at times punk, at times metal, at times experimental, but with serious chops. There were the periods that were Zappa-esque, mixing rock and experimental guitar with saxophone and bass runs. There was the dub-metal onslaught at times, reminiscent of the bands Last Exit, or Blind Idiot God. And there was also softer complex drones and percussive sounds from Yeung on guitar, with an array of interconnected effects pedals. These more experimental moments, enhanced with electronics, brought to mind the story about the band’s name coming from Neal Stephenson’s science-fiction writing (discussed during the pre-show Q&A). In contrast, there was a particularly fun moment when drummer Andre Custodio walked up on stage from the audience and sat down at a second drum set. 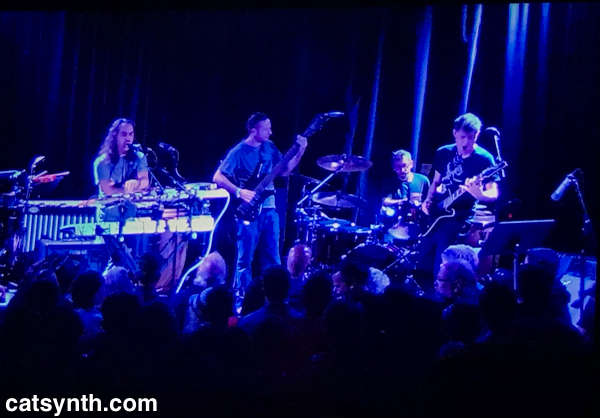 What ensued was an epic double-drum performance that was much funkier than the set as a whole, and also reminiscent of the multiple drum sets we saw a few weeks earlier with King Crimson. This was followed by a final segment that brought the set to a sonically intense close. It was then time for Surplus 1980 to take the stage. I did play with Surplus 1980 as part of the regular lineup from 2012 through 2015. I have seen them several times since then, but I have to say the current lineup and set has taken the band to a new level. The performance is tighter and there is increased variety among the tunes. The set began with two new tunes: “Pigeon Obstacle Course” and “Temporarily Present”. “Pigeon” was a short instrumental with Moe! Staiano and Melne wearing pigeon heads. “Temporarily Present” was a longer song, about 10 minutes, and quite reminiscent of early New Wave from late 1970s and early 1980s. Indeed, the call-and-response vocals between Moe! and Melne and new bassist HR Nelly reminded me a bit of early B-52s performances. The remaining “newish” song was “Question After Ended Question”, which features members of the band playing tuned bundt pans. After this, the band continued with some familiar songs. I have to admit, I did feel pretty nostalgic hopping up and down during “Failure of Commitment” as I did when I played with them. The new feature on that tune was Moe! on saz. And Melne has come into her own on staging, providing energy and character enough of the whole band. One often just sees her as a bright pink blur as she dances about the stage. Guitarist Bill Wolter was solid as always; and Mark Pino was a force of nature on drums, even overcoming a somewhat rebellious kick drum (you can read more about it on his blog.